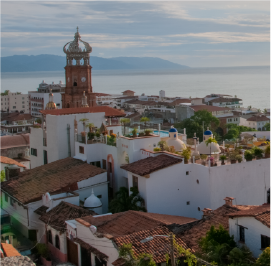 Puerto Vallarta is a popular choice for tourists. Its typical Mexican village atmosphere, added to the sun and beaches, make it a paradise. You will find everything from deluxe hotel complexes to rustic cabins equipped with every amenity. Besides enjoying its wonderful beaches, you can also browse around the local markets and shops for a souvenir. At whatever time of the year you come, there will always be something to surprise you: humpbacked whales, sea turtles, exotic birds, or the romantic tropical landscapes. Restaurants offer everything from typical Jalisco dishes to Mexican or international fare. At night you can dine at quiet restaurants with live romantic music, or, if you prefer, with the traditional mariachi music. Two and a half hours from Grand by highway.